Anyone run into this and know how to work around it? 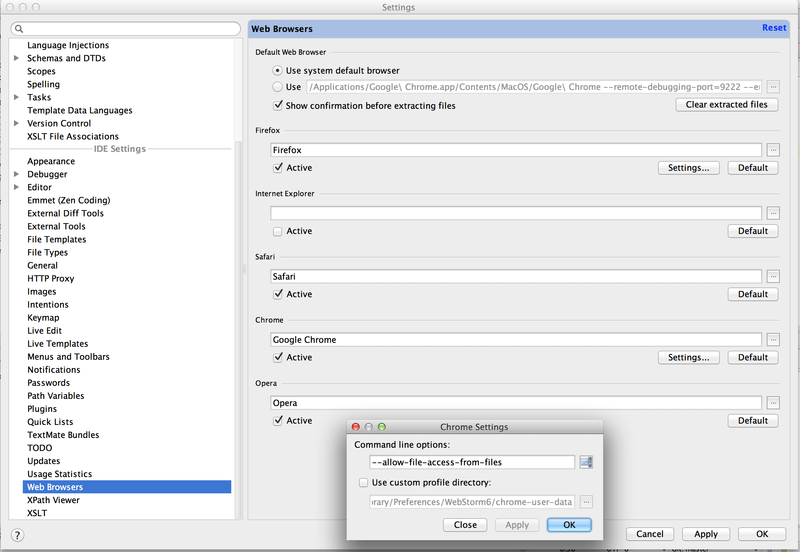 In WebStorm browsers are configured in "Preferences | Web Browsers"
Wow. Andriy, your 2,282nd post was a life-saver. Thank you so much. The links you gave me to the older docs were *really* helpful. I set it up as Remote and everything worked fine on the first try and I learned a lot in the process. Thanks again. It looks like the --allow-file-access-from-files does not work. Could you please give more details? I tried setting it in the command line settings but it still does not work. I've attached a screenshot. flag -- maybe you need both of them (sorry, I'm not using Chrome myself for developing, so not sure). In any case: make sure that no Chrome browser is running at that time, otherwise old (already running) instance most likely will be used instead (which did not had those options when launched). The solution turns out to be to close all chrome browsers and start the live edit. I didnt need to use --disable-web-security flag. Another life saver from you. I was struggling with this since morning. Great product so far !